With Matt Forte moving on to greener pastures, the New York Jets bolstered their backfield with the addition of Isaiah Crowell in free agency. Crowell joins incumbent running backs Bilal Powell and Elijah McGuire, both of whom mixed in with Forte last season. 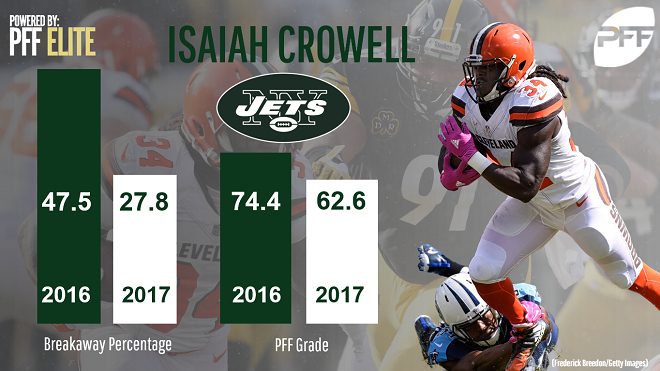 While he’s flashed potential at various points in his first four years in the league, Crowell hasn’t been able to string together consistent statistical performances. His best fantasy finish came in 2016 when he ranked a respectable 14th among running backs in fantasy scoring. Otherwise, Crowell has been essentially an RB3. Of course, it’s tough to place all of the blame on Crowell for his lackluster fantasy numbers. He played for a team that failed to post a winning record in any of his four years in the league and has won a combined four games over the past three seasons. That general ineptitude when it comes to winning football games typically isn’t the recipe for fantasy success at the running back position. Unfortunately for Crowell’s fantasy stock, he doesn’t really step into an ideal situation with the Jets. New York re-signed Josh McCown and brought Teddy Bridgewater in, but neither player instills a ton of confidence that the Jets will have stability at quarterback. To make matters worse, our team ranked the Jets offensive line No. 30 in the league for 2017. Crowell is likely to serve as the lead back in early downs and has shown the ability to catch the ball out of the backfield. However, Powell and McGuire also figure to have a role on passing downs. Much like we saw last season in New York, this three-headed committee will limit Crowell’s touch ceiling. It would be surprising to see him top 250 touches. That lack of volume bodes poorly for his fantasy stock, and it’s tough to view him as anything more than a fringe RB2 in 2018.